Building Blocks on Balmoral | prairie architects inc. 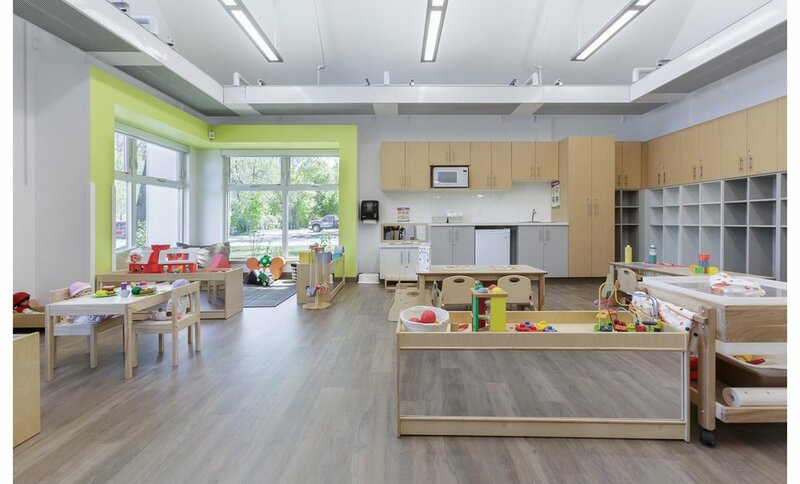 The new childcare facility, Building Blocks on Balmoral at Great-West Life YMCA-YWCA of Winnipeg, is an exemplary case study highlighting the success of adaptive re-use of heritage buildings. 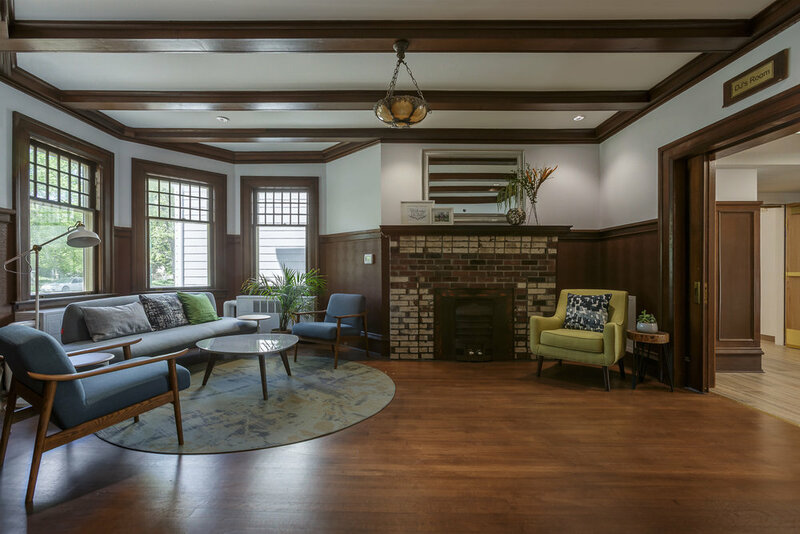 Once vacant and derelict, the Milner House now sits at the heart of a much-needed facility providing 100 licensed childcare spots to Great-West Life employees and its surrounding West Broadway community. In addition to the extraordinary measures that Great-West Life undertook to rehabilitate the grade III heritage building, there is another equally impressive story. 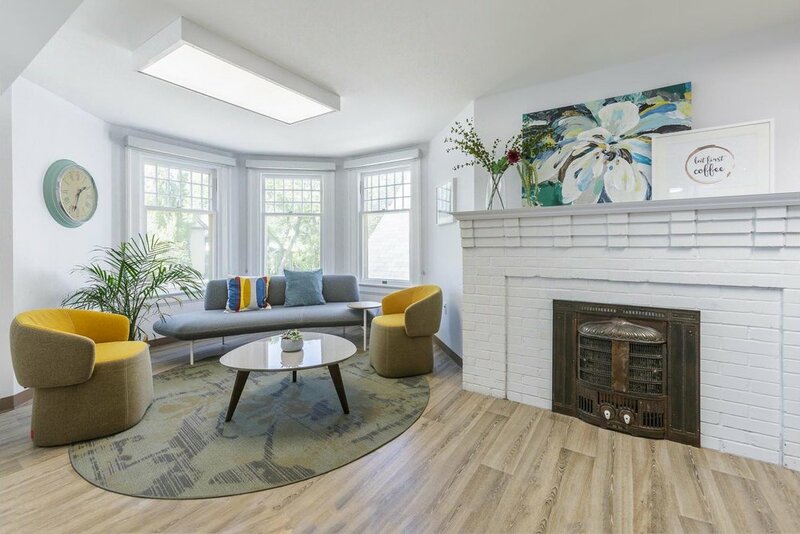 Not only has this endeavour restored the Milner House to again have a useful life, it has transformed the building to be among the leaders of sustainable, energy conserving and healthy buildings in Canada. With an array of sustainable features that include geothermal ground source heat-pump with in-floor radiant heating and chilled beams for cooling; displacement ventilation translating to lower fan power; significant use of salvaged, refurbished and re-used materials; substantial water use reduction; an abundance of daylight and views; and use of low-emitting materials, the new facility is LEED Platinum certified. Although the heritage structure has new life, its story began over a century ago. In the early 1900s, Western Canada experienced significant growth in its economy, social institutions and population. As the region’s major centre, Winnipeg underwent a building boom to keep pace with the growth. Many new residential districts emerged, including a new subdivision of 63 lots where a two-and-a-half storey, brick-veneered house was built in 1909 for William E. Milner. The family estate retained ownership of the house until 1991, when it sold to Great-West Life Assurance Company, which had acquired and demolished a number of neighbouring houses in the 1970s as part of an expansion. As such, the Milner House is the last remaining house on the east side of Balmoral Street. In 1995 the house was listed as a Historical Resource with Grade III designation, which prevented its demolition or removal and regulated any alteration or repair. Faced with a decision on what to do with the heritage structure, Great-West Life came up with the idea of incorporating it into a new day care complex that satisfied a need for child care space for both the company and the community. The design objective was to accommodate licensed spaces for 100 infant, toddler and pre-school aged children in a new facility, incorporating the heritage structure within a highly sustainable framework. In 2015, Prairie Architects Inc. was hired to execute the project. The design team undertook extensive building and site review, research, community consultation, re-zoning and development permitting processes. An engineering assessment of the structure indicated a number of areas of concern, but most significantly, substantial foundation movement and heaving of the basement slab, which meant that a new foundation was required to support the house. 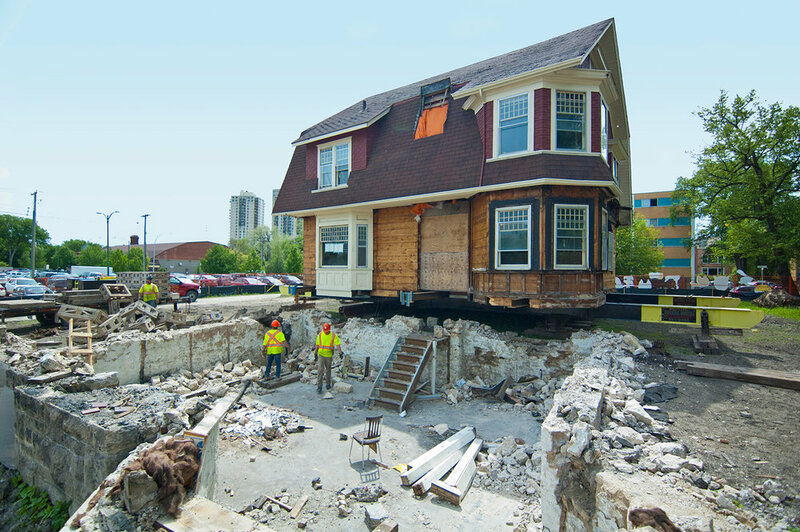 However, in order to do this, the entire house had to first be stabilized, then cut from its existing foundation, lifted and moved to allow for an entirely new foundation to be poured. To accommodate this move, the interior plaster and finishing were stripped, and the entirety of the exterior masonry veneer had to be removed as it was supported directly on the foundation wall. All of the original masonry was salvaged and used to re-clad the building to retain the original arrangement. 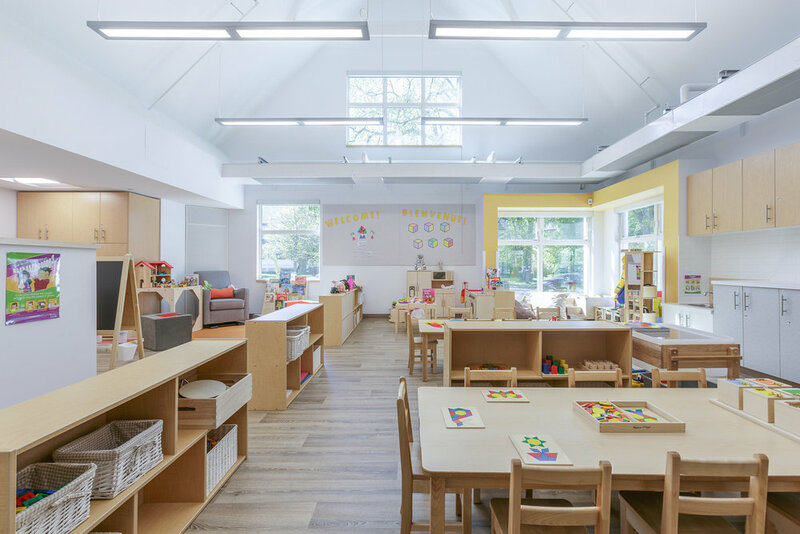 With an overall energy use reduction of 56% less than a model building, the day care’s energy use was even less than initial design expectations and achieved over 50% potable water use reduction through water conserving fixtures alone. The project originally targeted LEED Gold certification, but through an array of sustainable and energy conserving design features including: a geothermal ground source heat-pump system with in-floor radiant heating and passive chilled beams for cooling; an exhaust air heat recovery; displacement ventilation translating to lower fan power and optimal fresh air delivery; reduced lighting power densities; and increased roof and above grade u-values, the facility exceeded expectations and received LEED Platinum certification. Additionally, the building was designed to allow for the installation of photovoltaic solar arrays at a future date, which would offset roughly 10kW of electricity in the facility. As regional priorities for urban projects in the prairies, water conservation, energy efficiency and the redevelopment of an existing urban site became important guiding factors in the project’s overall sustainability goals. Systems and elements of the building design were selected to maximize occupant comfort, minimize energy consumption and contribute to a healthy environment for children and staff. This was achieved not only through the engineered systems and increased insulation levels, but also through providing ample access to natural daylight and views to the outdoors with large windows in each of the child care rooms designed with lowered sills to accommodate a toddler’s height. As a sustainable facility, which is first and foremost focused on health, indoor environmental quality is a priority. The daycare has been designed with a 100% fresh air ventilation and all carpet, adhesives, sealants, paints and coatings used in the building were specifically chosen to have no or low VOCs. These measures and others contribute to less asthma and environmental illnesses as well as less absenteeism, and in turn lead to children having greater attention during the day and greater retention rates of staff and children. Additional features that contribute to the facility’s sustainability include: CO2, occupancy and daylight sensors; high performance triple glazing; conducting an air flush prior to the occupancy; and fully electric systems that produce zero GHG emissions. A durable building ensures the selection of durable materials and components, quality control during construction, and increases the service life of the building. Following the standards set out by the funding authority, the day care is designed for a 50-year lifespan. Additionally, the stakeholder group established sustainable goals that had a positive effect on the neighbouring homes in the community by preventing light pollution from trespassing off the site as well as into the night sky. Together, the contractor and design team diverted almost 90% of construction waste from the landfill for reuse, recycle, or repurposing. Over 14% of new materials, including flooring, insulation, concrete, rebar and even landscaping materials contained recycled content. With reuse of many structural and non-structural components, over 36% of new and existing materials were extracted and manufactured within an 800km radius of the project site (or transported by rail within a 2400km radius). Original sinks and tubs, radiators and other components were salvaged and donated to neighbours or those involved in the project. A decision was also made by Great-West Life to restore the interior finishes similar to that of the original house. Many existing components such as the central staircase, original windows and sliding pocket doors were left in place and restored, while other items that had to be removed through the course of construction such as the original wood trim and brick fireplaces, were inventoried and documented to allow the re-installation and restoration. This process preserved historic features and eliminated need to purchase new. Additionally, over 75% of the original structural walls, floors and roof of the existing house have been maintained, including reuse of several materials within. The existing materials reused contributed to 16% savings, by cost, of all new materials in the project. Retaining original building materials reduces the environmental impacts of extracting, manufacturing, transporting, and incorporating new materials into the project and was a large contributing factor toward the LEED certification of this project. For more information on the history of the Milner House, please visit The Official Blog of Heritage Winnipeg.